Tutorial: What do I do when I think I have an orphan enzyme? You have an enzyme name and no sequence data. That might mean you have an orphan enzyme? What do you do next? Here is an overall approach to figuring out if you have an orphan enzyme, and if you do, finding a sequence for it. 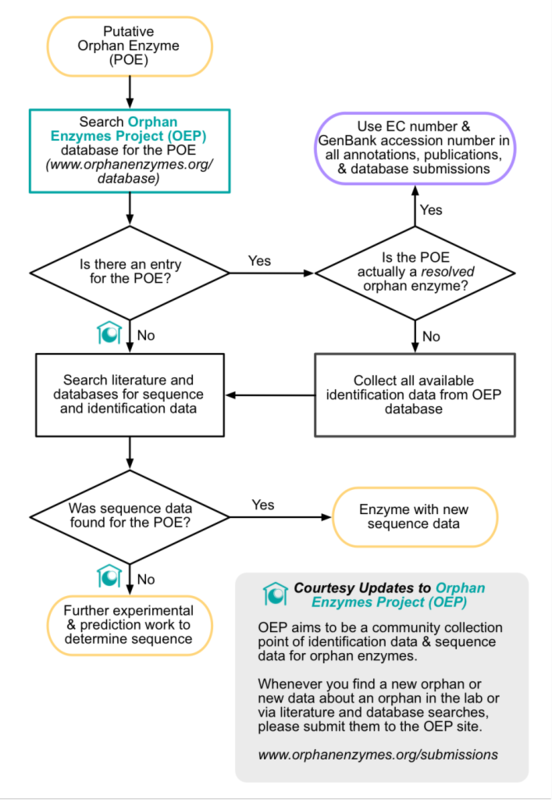 The very first thing we recommend you do if you think you have an orphan enzyme is to check to see if it is already in the OEP database. If it is, then we have probably already done all of the work involved in evaluating the orphan enzyme, including finding supporting identification data. You can check the orphan enzyme database here. If the orphan enzyme has already been resolved, we encourage you to use both its EC number and GenBank accession numbers in future publications, genome annotations, and database submissions. If the enzyme is not already covered by the OEP database, then we recommend following our process of literature, patent, and database evaluation. First, you will want to confirm that you really have an orphan enzyme. Click here to read the tutorial about how to confirm that you actually have an orphan enzyme. After you have confirmed that you truly have an orphan enzyme, then we recommend evaluating the orphan enzyme using our patent, literature, and database review process. Click here to read a tutorial that explains how to use literature, patent, and database review to try and find sequence data and identification information for your orphan enzyme. At the end of this process, you may have found a new enzyme sequence. If so, we recommend that you read the tutorial on how to report a new enzyme sequence.